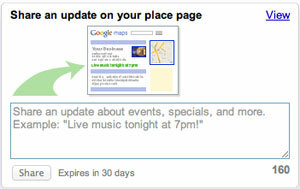 For at least the past week, the post to your place page feature within Google Places has not worked. In fact, there are a lot of things not working with Google Places. We know Google is working hard to revamp Google Places, it seems like from the ground up. So I guess we need to just be patient and wait it out. This feature was also not working in November. Googler Vanessa did tell us a week ago that, "**The Post to your Place page feature should update to your listing near instantly, but we're experiencing some technical issues with that right now. Expect a fix very soon." How soon is "very soon" - well, at least not a week soon.